The organisers gratefully acknowledge generous support from the LMS. The organisers gratefully acknowledge support from the IMA. Conference photos are available here and here. John Craske (Imperial) for "A robust mathematical model for unsteady turbulent jets: development and analysis". Rosanna Cretney (Open University) for "J.H. Lambert on the mathematics of map-making". Jack Shotton (Imperial) for "Local Galois deformation rings when l≠p". Jennifer Jones (Bath) for "Modelling the formation of a buprenorphine reservoir in the stratum corneum". Lyndon Koens (Cambridge) for "Slender ribbon theory". Oliver Southwick (UCL) for "A point-vortex model for the formation of ocean eddies by flow separation". Radu Cimpeanu (Imperial) for "How to make a splash: droplet impact and liquid film applications in aerodynamics". 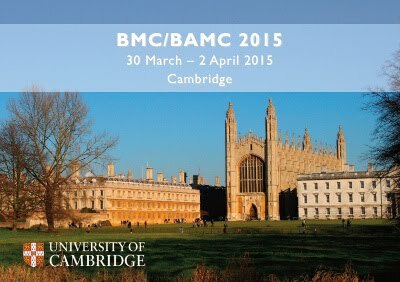 A Joint Meeting of the British Mathematical Colloquium (BMC) and the British Applied Mathematics Colloquium (BAMC) was held at the University of Cambridge from 11:00 on Monday 30th March 2015 to 13:00 on Thursday 2nd April 2015. This was the 4th Joint Meeting following Warwick (2002), Liverpool (2005) and Edinburgh (2010). The Conference Booklet; a hard-copy of this booklet was handed out at registration. The Booklet of Abstracts. We hope that delegates will use the on-line version (either the standard version or the small-devices version); please note the "Table of Contents" and "Index" active links at the bottom of each page. A few versions of this booklet are available at the conference desk in the CMS. An Addendum to the above material. All timetabled talks included at least 2 minutes of questions and 1 minute changeover between speakers. For example, a 20-minute slot provided time for a 17-minute presentation at maximum. Session chairs were asked to stick rigidly to the timetable to allow delegates to switch between talks in different rooms. After extremely high demand, registration sold out. 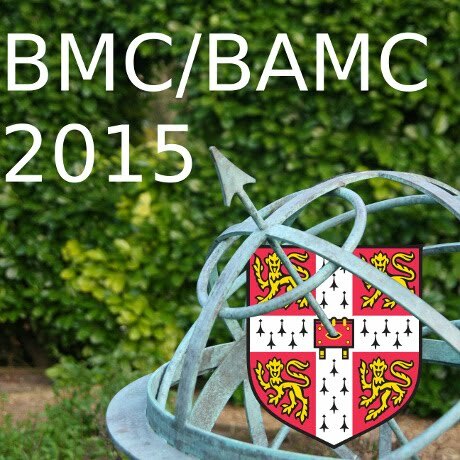 Abstract submission closed on 7th February 2015. There was a celebration of the 150th Anniversary of the LMS on 1st April 2015. The Conference Dinner was held on the evening of the same day. A Public Lecture, sponsored by the Institute of Mathematics and its Applications, was given jointly by Stephen Hawking and Michael Green at 19:00 on Tuesday 31st March. Please see the Public Lecture page for more details.